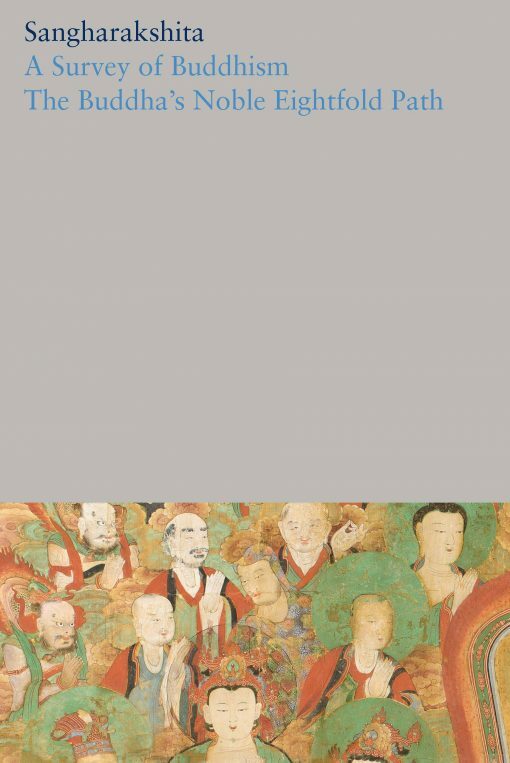 This first volume of Sangharakshita’s Complete Works includes two foundational texts that have inspired readers for decades: A Survey of Buddhism and The Buddha’s Noble Eightfold Path. Of the first, the great Buddhist teacher and writer Lama Anagarika Govinda wrote, ‘It would be difficult to find a single book in which the history and development of Buddhist thought has been described as vividly and clearly as in this survey.’ The first chapter illuminates the doctrines and methods common to all schools and draws out the transcendental unity of Buddhism. Later chapters discuss the teachings and practices of the different schools. The concluding chapter is dedicated to the bodhisattva ideal, ‘the perfectly ripened fruit of the whole vast tree of Buddhism’. Sangharakshita’s beautiful prose, shot through with poetry, combines with an exceptional clarity of thought to make the Survey one of the most inspiring elucidations of the Dharma. The Buddha’s Noble Eightfold Path: Vision and Transformation looks at one of the best known formulations of the Buddha’s teaching. We are led step by step from the mundane world to the transcendental, from wrong view to right view, and on to Perfect Vision. A practical perspective shows how we can apply the Buddha’s teachings to all aspects of our lives, including the food we eat, our relationships and our work. Sangharakshita goes on to make clear the true meaning of mindfulness and meditation, thus giving the reader both a vision of the whole path and guidance in setting out upon it.